According to the Babson Survey Research Group's latest annual report on distance education in the United States, online student enrollment has grown for the 14th year in a row. 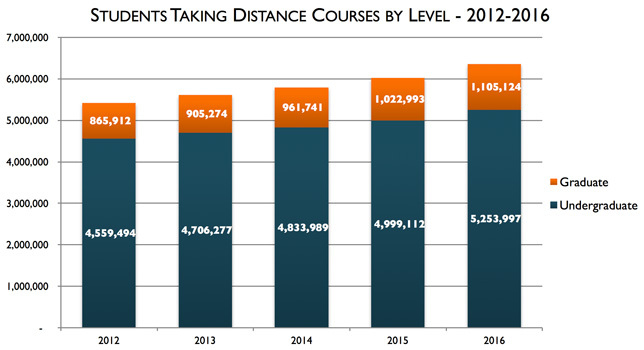 Nearly a million additional students took distance education courses in 2016 compared to 2012, a count consisting of both people who took online classes (or other forms of distance ed) exclusively as well as those who took a mix of online and face-to-face courses. That translates to more than 30 percent of colleges students — 6.4 million in total — who took at least one distance education course during the 2015-2016 academic year. Conversely, a million fewer students came to campus for their college education in 2016 than in 2012. "The growth of distance enrollments has been relentless," said study co-author Julia Seaman, research director of the research group, in a prepared statement. "They have gone up when the economy was expanding, when the economy was shrinking, when overall enrollments were growing, and now when overall enrollments are shrinking." Private for-profit colleges' online programs continued experiencing an avalanche of decline, losing more than 39,000 students during 2015-2016, up against a 90,000-student decline in the previous year, and reflecting the "overall loss" of student enrollment in the for-profit sector in that same period. At the same time public institutions saw the largest online enrollment gain in 2015-2016, up 7.3 percent, representing nearly 300,000 students — compared to an increase of 7.1 percent (76,000 students) at private nonprofit schools. Most students (53 percent) took at least one course online while also attending class on campus. And a majority of students (56 percent) who tackled exclusively online programs were located in the same state as the institution where they're enrolled. That was even more true for students enrolled in public institutions (84 percent) than it was for those at nonprofits (35.5 percent) and for-profits (16.5 percent). The state with the highest proportion of in-state students pursuing distance education exclusively was Nevada, at 93.5 percent. The institution with the largest enrollment of students taking any online courses during 2015-2016 continued to be the for-profit University of Phoenix, based in Arizona, with an online enrollment of 131,629. No. 2 was not-for-profit Western Governors U, based in Utah, with 84,289 students. The largest public institution online enrollment was 78,910 at Indiana's Ivy Tech Community College. The Babson research operation works out of Babson College. The report was sponsored by Pearson, the Online Learning Consortium and Tyton Partners. The complete report, "Great Increase: Tracking Distance Education in the United States," is available for registration on the research group's website.